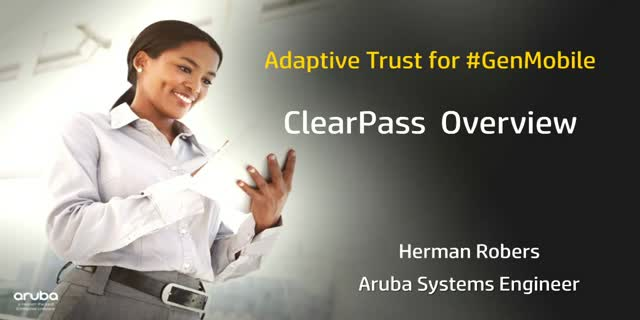 Watch a quick overview of Aruba ClearPass, the Gartner-leading Solution for Authentication and Access Management (NAC). Veeam® Cloud Backup-as-a-Service Offering is a new revenue stream for Service Providers you will want to know all about! Today, customers look for new ways to reduce costs while expecting a high system availability. You can help them meet this expectation, and at the same time increase your revenues and expand your service offering. Join us and some of the fastest growing Hosting and Cloud Service Providers by bringing the Cloud Backup-as-a-Service Offering into your portfolio. Your first step to increase your success is to simply join us on this webinar and find out how Veeam® and Hewlett Packard Enterprise's combined strength provides the right Backup-as-a-Service to your customers using HPE Apollo high-density servers coupled with Veeam’s versatile data recovery to give maximum efficiency and availability. Keen to know more? Watch now. You have nothing to lose and everything to gain. We are constantly told that every organisation is creating more and more digital data. But how do you store this without a similarly increasing IT budget? Through the alignment of technology and best operational practice we can demonstrate how IT departments are reducing by up to 80% their overall costs related to data storage. It is not just about cost reduction, the best IT departments also attain higher levels of customer satisfaction from application owners and end-users whilst delivering these savings. In this webinar we will look at how different approaches to data management, combined with different technologies, can actually impact the cost and satisfaction of storing the organisations critical information. The time of the next-generation networks is now! Hewlett Packard Enterprise opens a new chapter in the company history with HPE Aruba. The combination of HPE’s strength in switching and Aruba’s leadership in Mobility solutions crafts a new bridge for modern companies to the New Style of Business. Learn about the latest trends, our strategy, value proposition and how the combined strengths of these two technology leaders translate into new innovations and value for your business! Meet also our customer, the KBC Bank, taking you through their journey of workplace transformation into a modern, wireless only workplace. See why customers prefer HPE Top of Rack and reduce cost whilst boosting performance. This presentation provides an overview of the FlexFabric Top of Rack portfolio, highlighting key differentiators, such as IRF – Intelligent Resilient Fabric. Why do customers like to use IMC? As this single pane of glass network management tool helps to reduce cost, and improves network performance and troubleshooting. This multivendor tool can be used in your datacenter, campus and branch network environment. It provides one integrated overview of how virtual and physical, wired and/or wireless environments perform. Provision a new virtual network in just 10 minutes within a secure and multi-tenant environment thanks to Software Define Network (SDN) approach. Welcome to the Hewlett Packard Enterprise webinar platform. Learn about our latest innovations, solutions, services and products from HPE specialists.